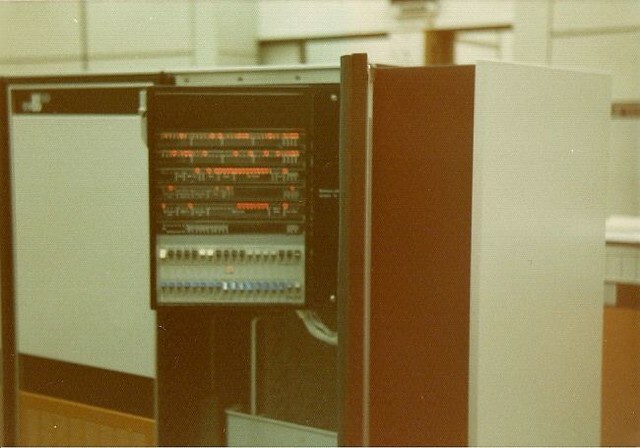 One of the first design decisions I made for LEO-1 was that it would be a pure 16-bit machine. I wanted to make something that would be unlike anything I had prior experience of and yet would still be useful, while at the same time not being too terribly expensive to build for real if I decided to do that. It was pretty clear to me that it would be more expensive to build, say, a 32-bit machine than it would be to build an 8-bit machine, because the cost pretty much scales with the number of bits you want. 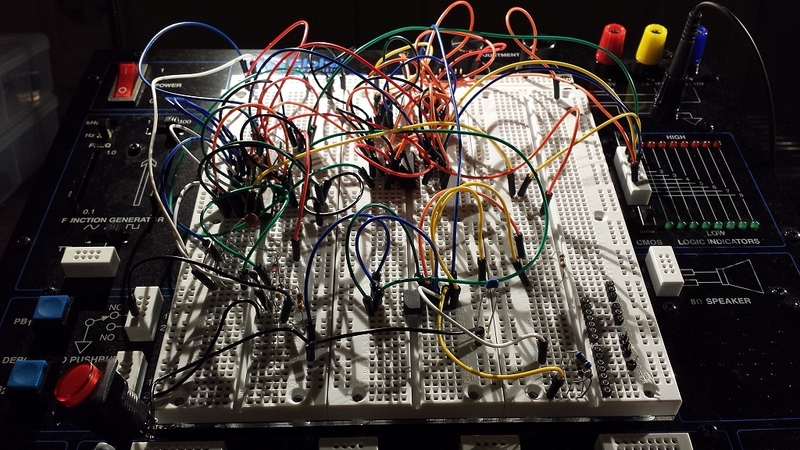 For example, if you want to make a 4-bit CPU, you could use a 4-bit adder chip in the ALU. 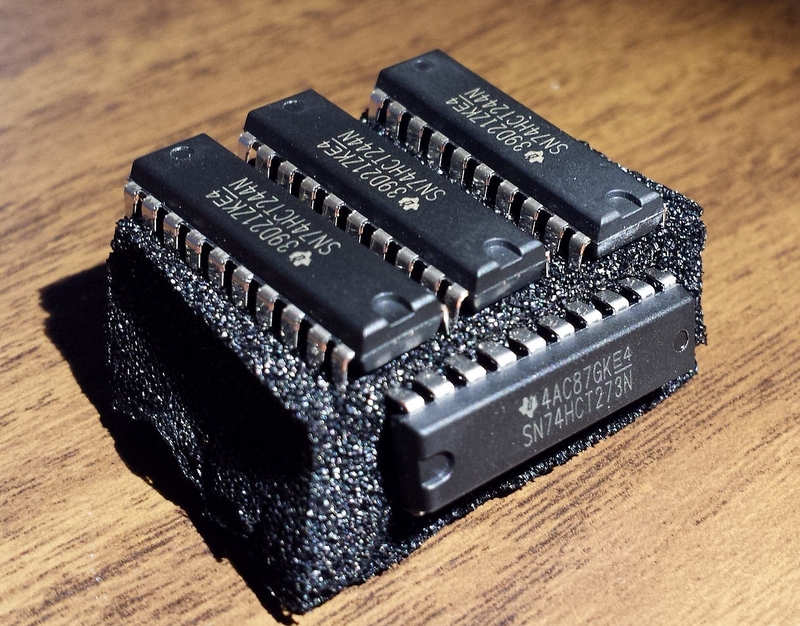 But if you wanted 32-bits, you would need eight of those chips in a cascaded arrangement. Similarly, registers, bus drivers and all that kind of stuff scales in cost according to the number of bits. More bits needs more chips. Chips are cheap, but the more chips you need, the more circuit board space you need. 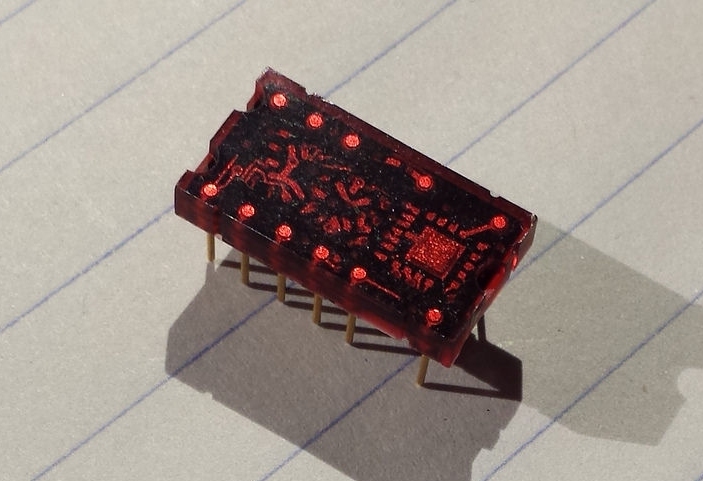 Circuit boards are not cheap, especially if you want proper ones made by a PCB house (which is something I’m considering as I’m very tired of messy veroboard circuits). Also, doubling the number of bits about doubles the power requirements and the amount of heat generated… and so on. So I made a compromise. I would have loved to build a 32-bit monster but it would have been slightly over-the-top for a first CPU. However, 8 bits just wasn’t enough and I’m a bit bored by 8-bit computers now. 16 bits is in the middle (and it also makes me think of the early minis like the PDP-11), so I decided on 16 bits. That also gave me a good chance of making a clean instruction set with one 16-bit word for every instruction. The second decision followed quickly after realising that 16 bits was good for packing a lot of codes and switches into an instruction word. That was the decision to not use microcode. The main reason for this is that I didn’t want to have to deal with writing microcode, fixing bugs in it and having to store it in a ROM somewhere. Microcode was invented to simplify the design of complex-instruction CPUs, but in order to simplify my design, I decided not to use it. This meant my instruction set was going to have to be pretty simple. 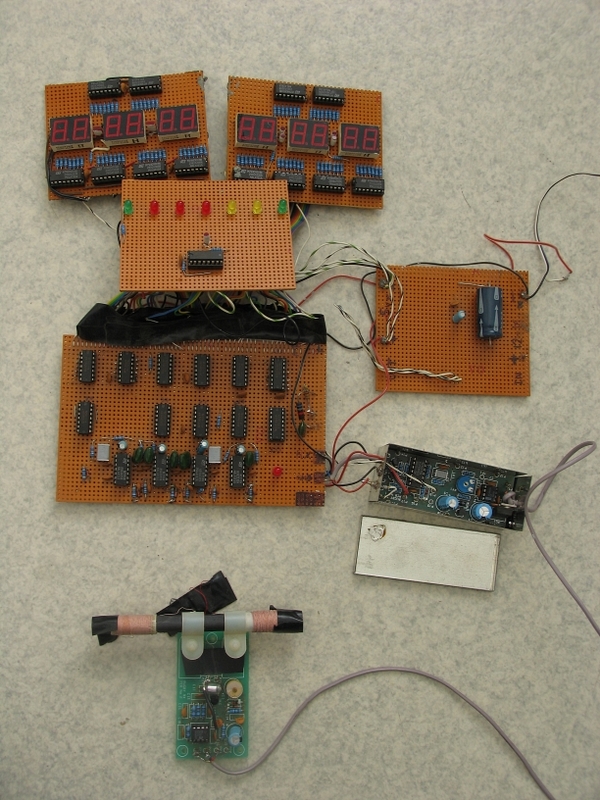 The simplest instruction set to build hardware for would have instructions that were all the same length and which were directly ‘wired’ to the registers and ALU and other circuitry. In other words, no microcode. The simplest hardware would also have only one ALU and things like registers would be generalized. Having a bunch of general purpose registers which can all do the same things instead of having an accumulator here and a stack pointer there and an index register somewhere else would just make it easier to design. With general purpose registers, you can design one and then clone it as many times as you like. Of course, the number of registers you can have depends on how many you can address from within an instruction. I decided on eight, which requires three instruction bits to provide a register identifier from 0 to 7. I called the registers R0 to R7 and they are all exactly the same. I also gave a bit of thought to performance. 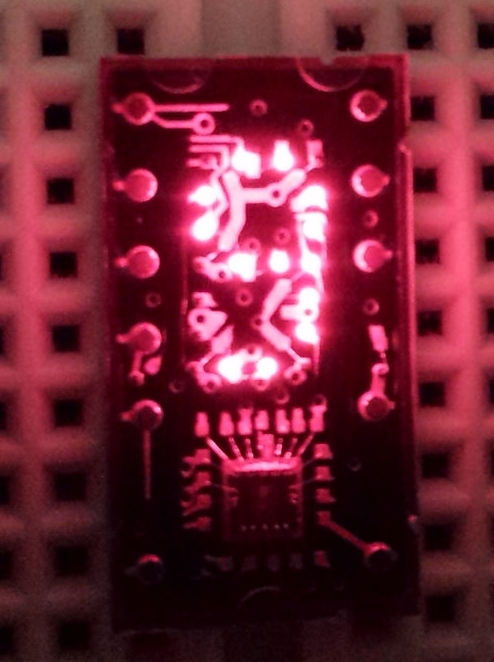 Using TTL chips I’m not likely to be able to get into the megahertz clock range, I shouldn’t think. I’ll be happy if it runs at 1MHz. In fact, I’ll be happy if it runs at any speed. But I decided early on to make a conscious effort to minimise the number of clock cycles needed to run one instruction. The fewer cycles per instruction, the faster it can go. That was when things got really tricky in the simulator. I found you have to be really careful to make sure that ‘stuff has time to happen’ after each clock tick. For example, you can’t put a memory address on the address bus and expect the memory to be ready at the same moment. There is a real delay, in the order of tens of nanoseconds, before the requested data will be stable on the data bus. So you have to wait at least one clock cycle after addressing the memory before trying to read the data out. Also, the clock ticks have to be far enough apart which is why you can’t just crank up the clock speed indefinitely and expect it to just ‘go faster’. There are also other hazards to think about like race conditions and bus contention. I started to get freaked out by how much you have to consider and how the problem gets worse the faster the circuit is clocked. A few times I almost decided I couldn’t do this and it might be wise to stop. It really made me appreciate the ingenuity of the engineers who designed the computer I’m writing this on. The CPU in my computer is (at least) thousands of times faster than LEO-1 will ever be and probably thousands of times more efficient with its caches and pipelines and branch prediction and whatever else miracles they managed to squeeze into it. I couldn’t even figure out how to implement a simple pipeline and I gave up thinking about it pretty quickly. Anyway, as I designed the instructions and played around in Logisim I realised that the instructions were reminding me of something I’d seen before, namely RISC instructions. In particular, when I came to design the memory access instructions I found that since I only had one ALU, I could calculate a memory address to load from, but I couldn’t use the loaded value to do more maths in the same instruction. This meant it was only possible to load or store to memory at some calculated address; in other words, LEO-1 has a load-store architecture. Although at first I was just experimenting without much planning ahead, I kind of gravitated towards a RISC design because I was trying to keep things simple. I let the limitations of the architecture guide the design of the instruction set. After a while I started getting inspiration from real RISC machines like the MIPS and I started letting the MIPS design guide me somewhat. I started to see why MIPS has no stack (and therefore no built-in nestable subroutine calls). All that kind of stuff requires either the use of microcode or else insanely complex electronics. Since this is complex enough already, I decided to go the same way. No stack pointer. No automatic subroutine calls. And no interrupts. That’s a decision that is still troubling me as I’m scared it might make the thing less usable in the end. Interrupts are needed for efficient interfacing to external devices and peripherals. Without them, LEO-1 will have to poll devices in a wait-loop and preemptive multitasking is entirely out of the question. Well, I’m not trying to design a real mini-computer with disc drives and tapes and I don’t plan on trying to port Minix to it either. I’m planning on having a simple hex keypad and an LCD display for debugging. I also have a fantasy of making a simple video card like the one on my MK14 if I can wrap my brain around doing that in TTL. Assuming the thing even works, if I ever do need to interface it to a UART or something, I’m sure there’s a way of doing it by polling instead of relying on getting an interrupt. Another design decision was to eliminate the concept of Condition Codes. At first, my simulation had the ‘traditional’ condition codes (Zero, Negative, Carry and Overflow) but they started to cause trouble. Since I was trying to limit the number of clock cycles needed to execute one instruction, I didn’t like the fact that there didn’t seem to be any reliable way to update the condition code register without burning a clock cycle to do it. I also didn’t like the way I had to ‘wire up’ the carry flag to check it, and the fact that if it was provided as a programmer-visible flag, I would need instructions to set and clear it. As for the overflow flag, the lack of that flag is not of much concern to me. In 35 years of programming I have never typed a single instruction that checked for overflow, but then again, I have never written a compiler or a maths library (or built a space rocket). Since I’m not planning to use LEO-1 for anything mission critical, I decided I could live without overflow handling as well. Other CPUs that don’t have condition codes such as MIPS handle overflow by using a trap which is like a software interrupt. Since I’m not doing interrupts, I can’t very well do traps either. So, checking for overflow will be completely out of the question without some heavy duty programming jiggery pokery around every operation that cares about overflow. Hopefully it won’t be a problem. As for zero and negative, that’s easy. You can check for zero with a wide AND gate and you can check for negative by just looking at bit 15 of a register. I was able to add instructions for branching if a particular register is ‘not zero’, ‘positive’ or ‘negative’. (It turns out you need a wide OR gate for checking ‘not zero’, but hey).